[S1249] Mary Forehand Melton Family Website [http://m4hand04.myweb.uga.edu/genealogy/index.htm]. James Melton was born ca 1734 in Orange County, North Carolina, and died after 1815 in Moore County, North Carolina. His wife's name is not known. 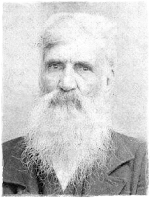 "James Melton, the great-great-grandfather of W. F. Melton, lived and raised his family in Moore Co., N. C. He had 7 sons and several daughters. One daughter married a Sheffield and lived most of her life in St. Clair Co., Ala. She was the mother of a large family of children. "The sons of James Melton were Ansel, James, John, Robert, William and Noah. (The other is forgotten.)" The Will of Robert Melton, made in Orange County, N. C., on April 24, 1759, and Certified in September Court 1759, says, "I Give and bequeath unto my Eldest sun James Melton one Puter Dish to valleu of five Shillings..." Robert Melton's Will does not leave James Melton any additional bequest and, in fact, does not refer to him again. References: Notes By Colonel Leonard Andrea, Columbia, S. C., Pages 5-6. The Melton Ledger by Wightman Fletcher Melton, Page 1. Letter and data from Bruce Pruitt, April 18, 1989 to Martha M. de l'Etoile. Tax List of 1815 of Moore County, N. C. from notes of Dr. Charles Holloman to Martha M. de l'Etoile on 4/08/1989. Will of Robert Melton, Orange County, N. C., will made April 24, 1759 and probated in September Court 1759.